Places with interesting acoustic properties have always been interesting to people around the globe: Cavernous canyons have mystical qualities, old churches can produce heavenly reverbs, and large man made halls can all create larger than life sounds. All of these spaces can be useful to audio engineers, but until fairly recently it was extremely hard to reproduce the exact properties of a particular acoustic space. Can you imagine how useful it would be to “sample” a room’s properties and recreate it anywhere and at anytime? Now, with so many convolution reverbs available to audio engineers, it has never been easier to do! You only need a few things to start creating your own impulse responses! Ahhh, what a great time to be an audio engineer. I’ve recently decided to start sampling spaces. As a sound designer and musician these will be useful in many ways. 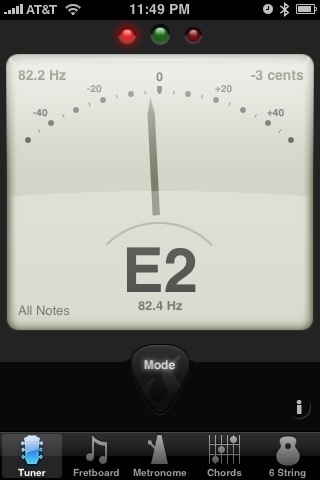 For example, I can sample a world class recording studio to give samples a more realistic room sound. Outdoor canyons can give an extra touch of realism to a space. I can also sample a trash can to see what texture that can add to my mixes. Another use is to sample locations you have recorded in so you can simulate them later for overdubbing or post. There are a multitude of creative applications for convolution reverbs. So why is it that none of the audio engineers I know take the time to record their own impulse responses for convolution reverbs? Over the years i have come to realize that if things aren’t simple and easily accessible they don’t get done. Now re-read that last sentence and really internalize it. To demonstrate this try putting your instrument out in the open for a week and see how often it gets played. Now take the same instrument, put it in it’s case and keep track of how often you play it. I guarantee you play it more when it is readily available. It is for this reason that I’m making a simple tutorial on how to sample your own acoustic spaces. I will attempt to sample a variety of spaces using a variety of gear; iPhone, portable PA (crate taxi), Microtrack, MBox, Rode NT4 and Studio Projects C4 microphones. These results should tell you what results you can get from these devices. They should also give you all the information you need to make your very own impulse responses! I will create the steps over a series of posts since otherwise this would be one giant post. Stay tuned for more soon! Ever since I heard Daft Punk’s “Around The World” I have wanted to recreate that sound. Now I can finally make this sound and you can too! Last week I broke down and bought a used Rocktron Banshee talk box! Since it was used I had to buy a replacement tube at Home Depot. I just received the power supply i bought online (It takes a 2000 ma 9V adapter). Now it is as good as new and I’m ready to rock!!! Behold, the Rocktron Banshee in all is glory! For those of you who don’t know the difference between Talkboxes, Autotuning and Vocoders I’ll quickly explain what kind of sounds they make. I will attempt to simplify this as much as possible. There are plenty of resources online to get more detailed info about their history and how they actually work. Videos of the Talk Box in use coming soon! Vocoders: These are processors that make voices sound robotic and synthetic. To oversimplify a very complex effect, vocoders essentially take a voice, modulate it with another sound source that has been divided into frequency bands, add some noise and let you control the levels of each sound. Most of today’s vocoders allow you to control the pitch of the signal and even play combinations of notes. Vocoders available to buy: Waves Morphoder (plug in), Native Instuments Vokator (plug in), Prosoniq Orange Vocoder (plug in), Nord Modular (hardware), Electro Harmonix Voice Box (Stomp Box). Autotune: Autotune is an effect that has become used in most recordings these days. These work by taking a signal, defining a set of notes that the sound can use, and only allowing the signal to use those notes. Many autotune devices can also be used with a keyboard to retune the vocal live, or in a sequencer, based on the notes being triggered while the signal is playing. 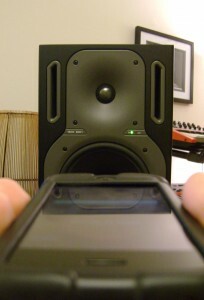 Their sound ranges from subtle pitch correction to inhuman-like pitch accuracy and vibrato. It sounds less robotic than vocoders has a high intelligibility. Autotune devices available to buy: Antares Autotune(plug in), Melodyne (plug in), Cubase 5 built in autotune. Talk Boxes: This is the sound I’ve wanted for so long. Talk boxes take an amplified signal, put it through a tube that goes to your mouth, and let you use your mouth as a filter. Microphones are only used to record the signal or send it to a PA. The sounds you can make with them range from simple formant filter (A, E, O, etc) to forming words while you play an instrument. 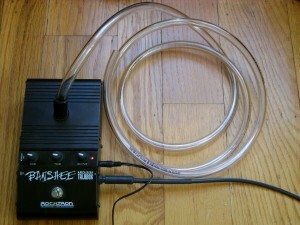 It is most typically used with distorted guitars or synthesizers. It is important to note that TalkBoxes can only exist in hardware unlike Vocoders and Autotune devices. Since your mouth is the filter it has to be a signal sent to your mouth to form that signal into words or formants. It is for this reason that Talk Boxes tend to sound like talking instruments more than processed voice. I guess it could be a virtual plug in if someone with years of free time could synthesize the human voice, create a digital representation of the mouth cavity, create words in real time, and side chain in a signal…. That’s a lot of work for something so simple. I recommend we quit trying to make everything a VST and accept that some things make more sense to exist as hardware. 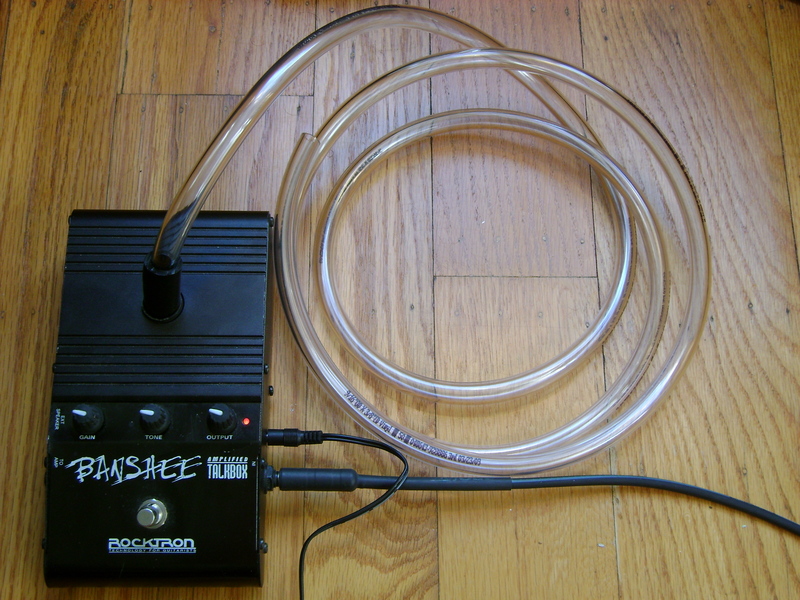 Talk Box devices available to buy: Rocktron Banshee, Heil Talk Box, Dan Electro Free Speech, Custom Built. Personally, I like the banshee option the most for it’s blend of simplicity and tone. Heil seems to have better tone, but there is more set up hassle involved. Dan Electro is commonly reviewed as the cheaper lesser option. There are a few tutorials online to build your own for cheap. If you do this I’d love to hear your results. Intonation Matters! Do you want the notes on your killer solo to be this out of tune? Have you ever picked up an stringed instrument that seems in tune, but as you play some chords up the neck it begins to sound out of tune? Perhaps you started to play a great lick only to find it just sounds kind of flat. I know I have and I used to blame cheap instruments and poor craftsmanship. As it turns out this could just mean the instrument isn’t set up properly. If you try to record an instrument that isn’t set up you will quickly find that tuning becomes a big issue. Playing with other people is also difficult because your tuning changes while theirs may be constantly in tune. The good news is that this can be very easy to fix! Intonation is one of the most important things to understand with many stringed instruments. Electric guitars, bass guitars, and even instruments like banjos all have adjustable intonation. Instruments like acoustic guitars make it much more difficult to adjust the intonation and will require help from a luthier. This is because the bridge on acoustics isn’t easily adjustable like those on electric guitars. You can test your instruments intonation by tuning the first open string correctly then playing the 12th fret on that string to see if it is still in tune. If the 12th fret note is sharp then your string length needs to be longer. If the 12th fret note is flat then the string needs to be shorter. 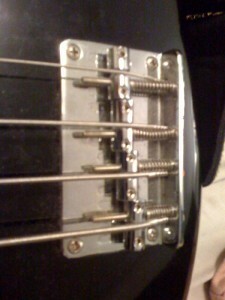 Adjust the bridge of your instrument appropriately. Now re-tune the string and test again. Once it is in tune on the open fret and 12th fret you can move on to the next one. Do this for all of the strings on your instrument and **BAM** you’ll have a properly tuned instrument ready to rock! Note that none of this covers the action of the guitar . That is a different issue that is also very important. I may make a post on this later. Here is a diagram of how to adjust the intonation on a banjo. Electric instruments usually just need a regular or small screwdriver to adjust their intonation. Follow the same steps as above and do each string one at a time. You’ll have a properly tuned instrument in no time! One thing worth mentioning is that you don’t want to press too hard on the 12th fret while making these adjustments. If you press too hard it will bend the string and produce a sharper pitch than you normally do while playing the guitar. Just try to press the 12th fret as hard as you would playing normally. 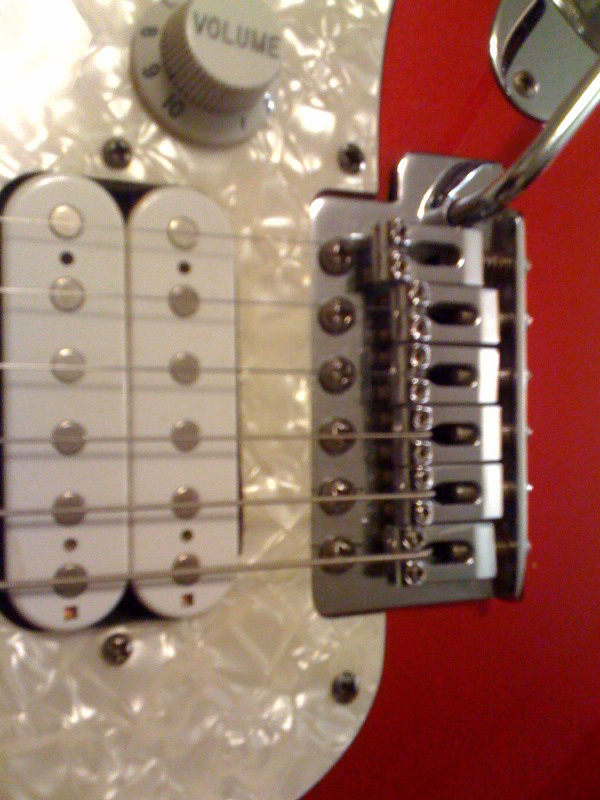 Fender Fat Strat Bridge – This is what mine looks like with good intonation. 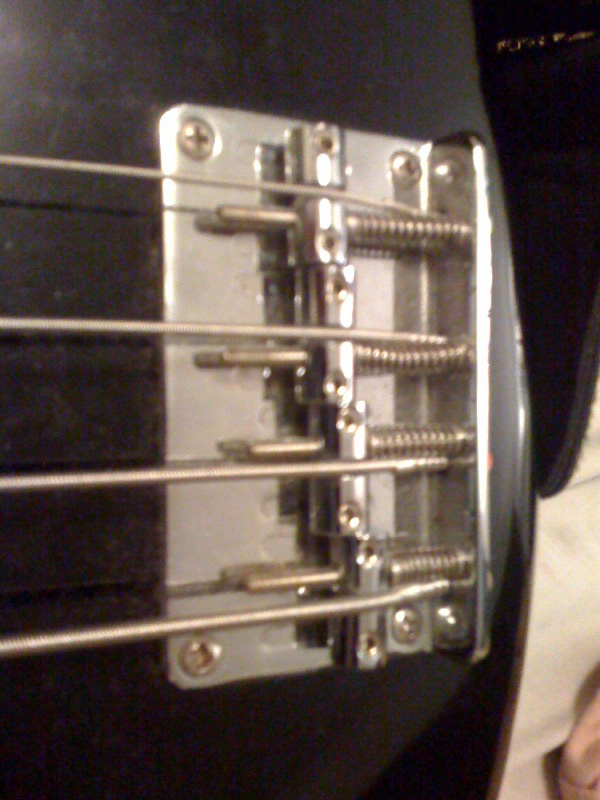 Bass Guitar Bridge – Properly intonated Ibanez GSR200. It should be just as in tune on an open string as it is on the same strings 12th fret of your instrument. I know it’s not perfect in these screenshots, but it’s really hard to get a screenshot while it’s perfectly in tune. 12th fret of the 6th string also in tune on the guitar. This proves that the 6th string is properly intonated. 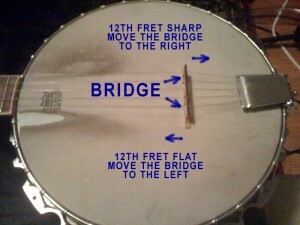 I’d like to thank the good people at Exploring Music for showing me how to properly set up my banjo. They have very helpful employees and cheap lessons. I took a few violin lessons there and I plan on returning!